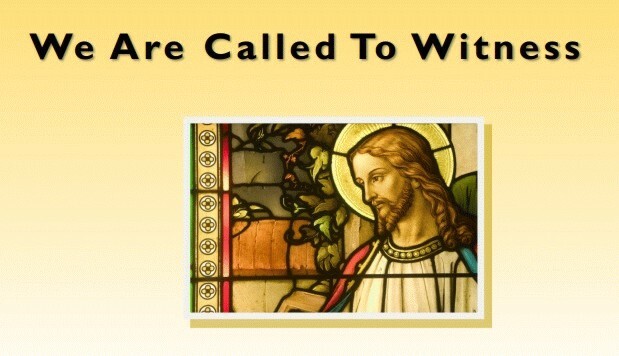 HOW TO USE " WE ARE CALLED TO WITNESS"
As it says on the opening page of the document, "We Are Called to Witness" is a program designed to help members and affiliations discover and actively participate in sharing the Good News, the Joy of Jesus...the New Evangelization. But what does that mean? Most of us have a pretty narrow definition of "evangelization" and what we envision when we hear the word is not very appealing. We think things like "I'm not knocking on doors!" or "I'm not accosting strangers on the street!" "We are Called to Witness" is meant to show us all a new way to spread the Joy of Jesus by using the existing projects or programs in our own parish affiliations. Encourage those we worry about the most - older teens and young adults - to stay connected to their religion through opportunities for service (something they all understand) and options available gto them to stay with their peers while developing their own relationship with God. Use the Resource chapter (section 9) for your own personal study. This document is designed to be used in whatever way is comfortable for you. It doesn't need to be used in order. You can choose one chapter and find ways to work on it through your own commissions all year. You don't have to read the whole thing at one time. Look at the Table of Contents, find something that interests you, read it, and then either use it or decide or decide to move on to another topic. NO KNOCKING ON DOORS! Just learning, sharing and developing your love of the Good News.